Each of the 29-member Legislature, represents a district of approximately 25,000 people. Since most legislators are also employed in the private sector of our community or own small businesses, many have two full-time jobs. However, as a citizen-representative each legislator brings a unique perspective and special expertise from his or her won profession and geographic area. 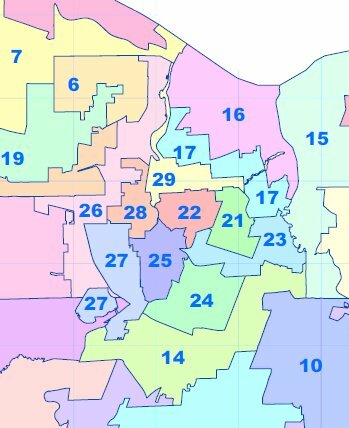 Attached are two legislative district maps. Please click either map to get a larger view. 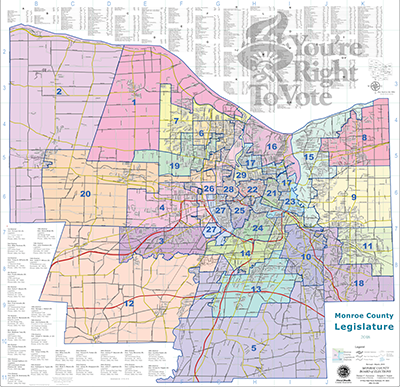 You may also locate your representative/district using our legislative chart below. If you are not certain what district you live in, the following chart breaks down each district by number, legislator, party and town. For more information about your representative, click on your legislator’s name. If you still require additional information, please contact the Monroe County Republican Majority Office at 585 753-1922 and/or the Monroe County Democratic Minority Office at 585 753-1940.